I've written here in the past about how the Disney shorts of the lat 1940s and early 1950s became somewhat formulaic. The Donald shorts were either him feuding with Chip & Dale over food or being menaced by a boss. 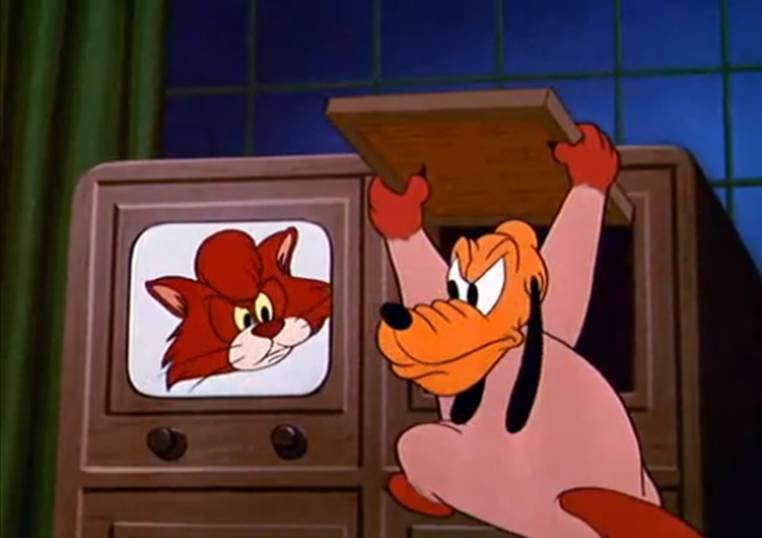 The Goofy shorts were very slice of life, with Goofy taking on the everyman role. And the Pluto shorts? Well Pluto basically fought with another animal, for one reason or another. Cold Turkey is no exception to this plan. The setup is simple, Pluto and the unnamed house cat are napping, watching wrestling of all things (this must be the Carousel of Progress house and Grandma is out for the moment). When a commercial for turkey comes on, both of them begin to crave some roasted bird, and apparently lose all capability for rational thought. Honestly, this is the dumbest I have seen Pluto behave in the MANY shorts I have watched. I mean, seriously? Pluto has never been the sharpest knife in the drawer, but searching through the innards of a television to find a turkey strikes me as a little much. The silliness of it all is certainly a piece of making good comedy, but in this case, it came off as trite, rather than an interesting use of Pluto. The same traits come across in the cat, as he repeatedly lets Pluto slam him into the ground while he stands on the top of a metal garbage can. This is almost a direct contradiction to how the short changes from that point forward. Once the turkey is discovered in the fridge, it's all out war between Pluto and his former friend, the cat. Things are silly, sure, but a little more entertaining. 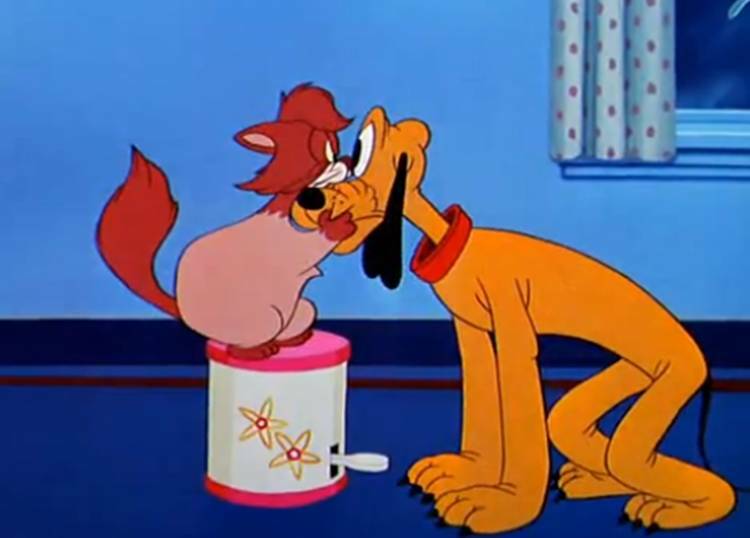 Even if it is a cliche, you still like to see Pluto working against another animal. The problem this time is that the two adversaries go from incredibly dumb to very cunning at the drop of a hat. 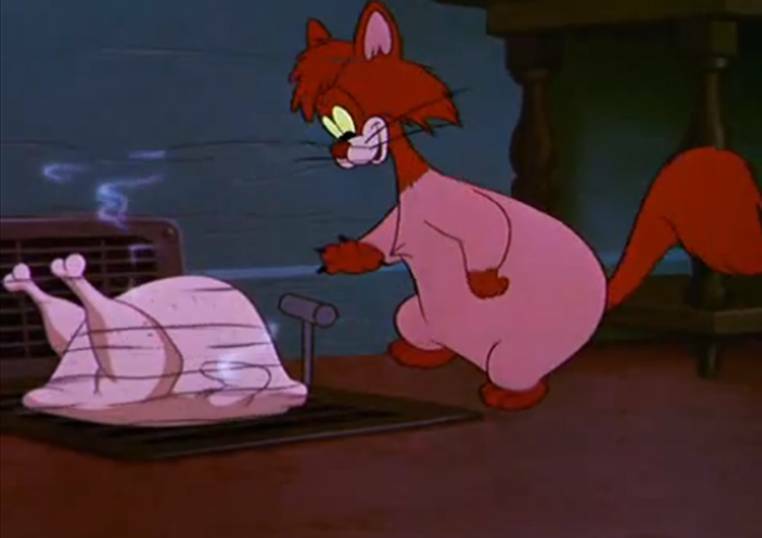 Pluto thinks to turn up the heat and smoke out the cat, the cat is roasting the turkey on a hot air vent. These crazy animals who couldn't figure out that a TV turkey wasn't real only moments earlier are now masters of strategy. It really drives home the inconsistency of the later shorts. In the earlier years, Mickey and friends were much more exciting and adventurous, not following the rules of physics or life, really. Now, Pluto has been tamed, set to struggle in the living room of a suburban house over a leftover turkey. It doesn't help that the animation in this short is just average. It's not bad, it's not good, it's just what you would expect from any Saturday morning cartoon. Cold Turkey ended up leaving me cold, and that's not what you want from one of the Fab Five. No offense, but that whole review left me cold. I considered this to be one of my favorite Pluto shorts and found it more entertaining than someone doing a poor imatation of Fred McMurray.